Design Incorporated provides pop-up book design to add another dimension to your printed collateral. Contact us to discover how we can bring engaging structure, narrative and interaction to your brochure. Paper engineering at any level of technical execution will add interest and stand-out to your brochure. 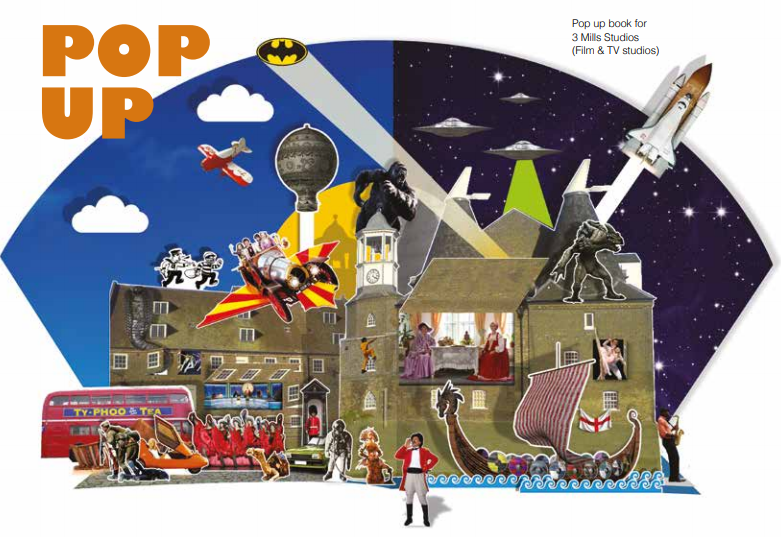 Pop-ups are not only for children’s books although there are some fantastic new children’s pop-up books out there these days which economic laser cutting has made possible. Pop-ups can bring to life important touch points, messages, facts or inter-related content in a more engaging way than the standard printed page. There are many excellent pop-up books on serious and/or technical subjects including one for the sub-atomic particle accelerator CERN in Switzerland that I have in my own personal collection. The pop-up concept above was developed for 3 Mills Studios as a metaphor for the huge potential offered by the studio village facilities in the East End of London. To find out more about how we could incorporate a pop-up into your next marketing or promotional printed collateral project. Please contact our Client Services Director Frank Norman on 01784 410380 or email.